The Phantom is a 1943 Columbia Pictures 15 chapter black-and-white cliffhanger superhero serial, produced by Rudolph C. Flothow, directed B. Reeves Eason, and starring Tom Tyler in the title role. It is based on Lee Falk’s comic strip The Phantom, first syndicated to newspapers in 1936 by King Features Syndicate. The serial also features Jeanne Bates as the Phantom’s girlfriend Diana Palmer, and Ace the Wonder Dog as the Phantom’s trusty German shepherd Devil (who is a wolf in the original comic strip). Professor Davidson plans an expedition to find the Lost City of Zoloz. The location of the city is contained on seven pieces of ivory, three of which Davidson already possesses. Doctor Bremmer, however, intends to find the lost city and use it as a secret airbase for his unnamed country. To remove him as an obstacle, he kills The Phantom, only for his recently returned son, Geoffrey Prescott, to inherit the family identity and take over the mantle of The Phantom. Three of the remaining ivory pieces are owned by Singapore Smith, who initially steals Davidson’s pieces. The seventh, and most important, piece is missing at first but turns up in the possession of Tartar (which The Phantom acquires by wrestling Tartar’s pet gorilla). Like most other serials, The Phantom had a relatively low budget. For the serial, the Phantom’s real name is Geoffrey Prescott. In the comic strip, due to his real name not having yet been introduced, a different character name was used for the serial. The Phantom’s real name was eventually introduced into the comic strip as Kit Walker. 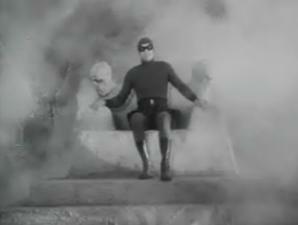 The Phantom tells Singapore Smith to call him “Walker” when he covers his costume with a hat, dark glasses, and an overcoat so he can enter civilization unobtrusively. Most of the serial was filmed in the Hollywood hills, which doubled as the African jungle. Actor Tom Tyler had an “almost uncanny” resemblance to the comic strip character. However, he was also described as wooden in his speech and movements, “the Gary Cooper of B films”.